Petunia (Petunia spp. ): growing, planting, caring. Showy trumpet-shaped flowers from spring to autumn - perfect for flower beds and window boxes. Scientific name : Petunia spp. Petunia is genus of 20 species of flowering plants of South American origin - an annual, most of the varieties seen in gardens are hybrids. They tolerate relatively harsh conditions and hot climates. They need at least five hours of sunlight every day, grow pretty well in low humidity, moist soil. Young plants can be - and are generally - grown from seeds. 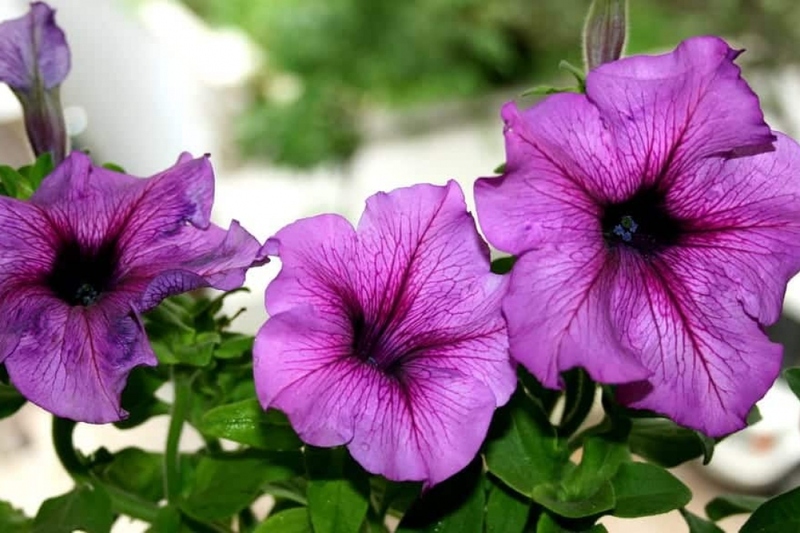 Petunias are divided into two different groups: Grandiflora petunias, with large flowers, are best grown in containers or hanging baskets, while multiflora petunias have smaller, but more abundant flowers and are ideal for summer bedding or in a mixed border. Petunias are of the Solanaceae family, with glandular hairs, and alternated full leaves, which are sessile. They can measure up to one meter, and are native from South America. The flowers are called actinimorphous - broad trumpet-shaped! Inside: The sowing is done with several seeds in each hole, into a suitable soil, from the month of February, without burying the seeds much. Outside: This method is not common, but in this case sow into a suitable soil, without covering the seeds, in draining soil, in full sun. Plant the seedlings as soon as they have some true leaves, and raise them in a bucket until the end of the frosts. After the frosts, plant your petunias bought in buckets, or transplant those sown by yourself in pots or in a well-drained open soil, in full sun. Mix soil with potting soil. Water copiously after planting. Yes, if you have not mulched around your petunias, it will be necessary to weed regularly, because spontaneous annuals love the same soil as your petunias do! Mulch, it's never too late! Petunias like frequent watering, without excess of water. After planting, we advise you to find a way to mulch your petunias, otherwise the weeding will be demanding. Use what your garden offers: leaves, crushed, choose the mulching that you like! The petunias bloom 6 months in a row, so the soil provided initially will get poor quickly! Yes, petunias are greedy ... Add potting soil, decomposed manure or another organic fertilizer every month. Pull up the plants in November, and use the remains as compost.